This evening 76 Stoke Newington Rd London – hosted the UK launch of Google Partners; the new umbrella scheme by Google designed to support and recognize trusted online marketing agencies that work with small to medium size businesses. Googleâ€™s Mark HoweÂ tonight himself said that â€˜SMEs are the underpinning, heartbeat of Googleâ€™. So it makes sense for Google to embrace and support digital marketing agencies in this sector. Already rolled out in the US last month, itâ€™s easy to see why the UK wasnâ€™t far behind. In his presentation Mark showed how the UK has the biggest digital advertising spend in the whole of Europe. So in a nutshell, Google Partners is the consolidation of all Googleâ€™s existing agency products like Adwords, Agency Edge, Engage and certification into one simple place now called Google Partners. Online Marketing Agencies who qualify for the new accreditation scheme receive the â€˜Google Partners Badgeâ€™, which supersedes all former certification badges. 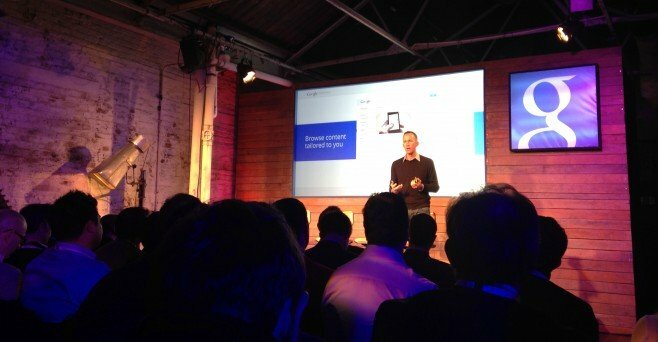 Google Product Manager Tim Frank announced that as of today – 65% of the formerly accredited UK Adwords agencies have been removed as they failed to meet the new higher requirements for Google Partners. A key message from Tim was that â€˜the bar has been raisedâ€™ making the scheme more exclusive and re-enforcing the quality and commitment Google is looking for in itsâ€™ partner agencies. UK Businesses looking for a Google Partner can do so by heading over to google.co.uk/partners and performing a search based on their location and/or requirements. Existing and prospective agencies looking to access the Google Partner Scheme can do so at the same address. Using your existing Google Login you can complete your individual profile and also affiliate yourself with an agency. Those looking to gain Partner Accreditation for their company can do so within their control panel by completing the necessary requirements set out within the dashboard. Within the Google Partners Dashboard, one of the most exciting new features is the extensive collection of Partner Academy Modules. Accessible via the Insights tab you can browse and favourite content that is tailored to you and your agency. 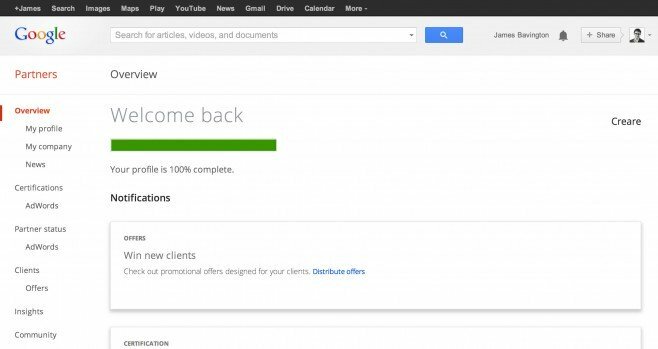 Not only are Google improving the quality and accessibility of their training modules, they are also providing more support in client acquisition, incentives and offers. Additionally a new Google+ Community for Partners has been set-up to allow individuals to stay up to date and discreetly share their experiences with fellow agencies and the Google team. Currently, the only certifications available with Google Partners are the three Adwords exams. You are required to pass at least two of these to be Adwords Qualified. The certification process however, is now available for free and is accessible instantly within the dashboard. Experienced and confident consultants are even able to take the exams on their smartphone. After his talk, I spoke with Product Manager Tim Frank about the future expansion of the Partners scheme. Tim explain how despite being initially focused on Adwords for launch, Google Partners will likely be expanded upon to incorporate certifications in YouTube, Google Analytics, Website Development and possibly even Organic SEO. Today was all about the launch of Google Parnters. A new badge, a higher bar, new certification, training and clarity over the existing range of agency products. Google look to be stepping up reciprocity with their agencies with clear advantages to both parties who strive to qualify and maintain their accreditation with Google. What excites me the most is the future of Google Partners, whereby additional channels such as Analytics and possibly even Organic SEO will be brought into scheme. This will allow multi-discipline or â€˜full-serviceâ€™ agencies like Creare to have individually certified professionals across a variety of departments that Small Businesses need for a successful online marketing campaign.